One of the word we are hearing frequently these days in association with yogurt is “probiotics” and probiotic literally means ‘For Life’! Our body needs to have a healthy amount of ”good” bacteria in the digestive tract, and many yogurts are made using active, good bacteria. Yogurt is a dairy product that is obtained by fermenting milk. This fermentation uses bacteria to transform milk which is a liquid into yogurt which is semi-solid in nature. Yogurt is a proven treasure-trove of enriching elements like zinc, calcium, lactic acid, Vitamins B1, B2, B-6 and B-12, protein, and yeast. It holds rich deposits of friendly bacteria that boost overall health as well as that of the hair and skin. Yogurt has a multitude of benefits that will surely work wonders for your hair and skin problems. Yogurt is very beneficial for skin. It adds natural oils to skin and it can dimish pore size too. Overall, it can improve our skin texture and adds a healthy glow to our skin. Yogurt is also know to treat acne and acne scars. You just have to apply it on the affected area daily for seeing the results. Yogurt is rich in zinc which is very good for skin and helps to clear out the skin. For making a good Yogurt mask for skin, take 1 tsp yogurt and 1/4 teaspoon of orange or lemon juice. Mix them and spread the mixture over your face. Let it be there for five minutes and then wash it off with warm water. For an added moisturization, you can alter the recipe – you can take 1/2 cup plain yogurt, add 1 tbsp olive oil and 1-1/2 teaspoon fresh lemon juice, and mix thoroughly. Smooth this paste over your face and leave it on for about ten minutes, then wash it off with warm water. If you have oily skin, you can use yogurt to exfoliate daily and remove blackheads and whiteheads. Isn’t that great!! We are always on the lookout for some good scrubs which can effectively remove blackheads and whiteheads without harming us and the ingredients for this is so easily available in our home and at no cost!! 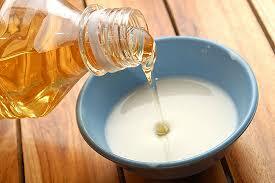 For making a mask for oily skin, take some rice powder and yogurt, and blend them into a thick coarse paste. Rub it into your skin in little circular movements. Leave it on for a while and then rinse it off. But one caution to take is – be very gentle when applying this paste if you have pimple or pimples marks as it may irritate the inflamed skin. Love your skin and be gentle 🙂. Yogurt is also beneficial in hair care. I use it very frequently for my curly hair and even for my 2 year old son J. Now, how to use Yogurt for hair? It can be the base of your conditioner and can also act as a cleanser. 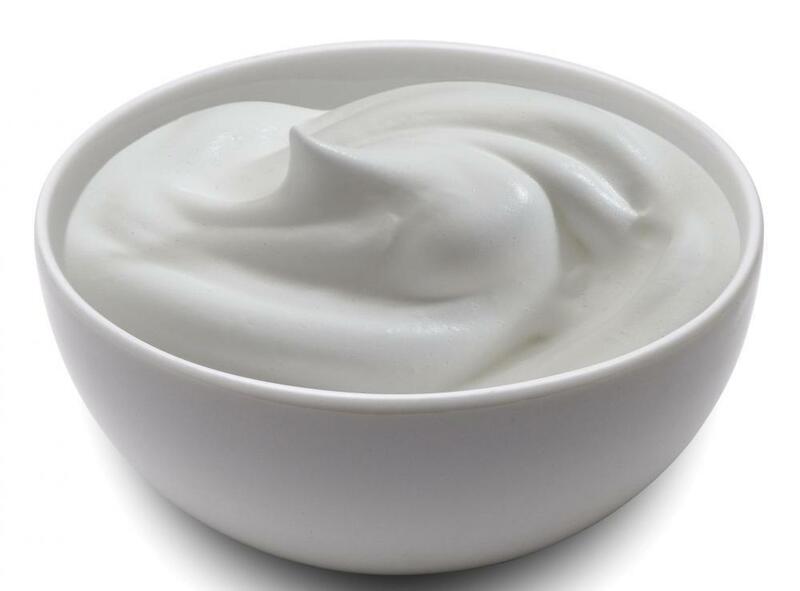 Yogurt promotes hair growth and makes it easy to comb hair and get rid of knots. To garner the benefits of yogurt, put about half a cup of whole yogurt in a blender and work it into a smooth paste. Coat your hair with it, wrap your hair in a towel, and then wash your hair thoroughly after about 15 minutes. I love doing this to my hair and I can feel the happiness of my hair after this simple treatment 🙂. You can even prevent frizzy hair with the help of yogurt. Take four tablespoons of plain yogurt and one egg, and mix them well in a bowl. Massage this mixture well into your hair, leave it for ten minutes, and then rinse it off. This conditioner can soften dull hair and add life to it. Besides all this, do eat yogurt and relish it all the way. Don’t forget to make yogurt a regular part of your diet! Go for the ends, if you don’t have much yogurt to spare. If you are not facing acute hair problems like itchy scalp or dandruff, and you’re running low on yogurt (or time), just apply it to the ends before washing your hair. Let it stay there for some time and then wash as usual. Add a little cocoa powder and honey for a full-on shiny, darkening hair mask. This is my absolute favorite thing to do, because I love a deep, rich brown tint in my hair. Just mix together 1 cup of plain yogurt, 2 tbsp. cocoa powder and 2 tbsp. honey. Apply all through your hair. Let this set for 30 minutes (to an hour) and then wash with shampoo. There’s definitely no need for conditioner after you’ve used this mask. Your hair will be soft, shiny, and out-of-this world with deep highlights. Drip in some lemon juice to bring out the blonde. If you’re more fair-haired, just toss in 2 tbsp of lemon juice with 1 cup of yogurt, apply to your hair, leave on 30 minutes and then wash as usual. Pure gold. Remove the shower cap and use a gentle shampoo to wash the mask from your hair after an hour. If you’d rather skip shampooing, simply rinse the yogurt out of your hair thoroughly using warm water. Let your hair dry then style as you normally would. You should notice that your hair feels much softer. This mask is superb for deep conditioning. Before setting out for a salon appointment or giving up on your hair, try this homemade hair mask and you won’t regret it !! Hair needs just as much nourishing as the rest of our body. We tend to pay more attention to our faces and our body than we do our hair, and because of that reason, many of us are left with what used to be shiny hair, but is now just a mess. Try this olive oil and yogurt conditioning hair mask for shinier, conditioned locks. Mix the yogurt and the olive oil together in a bowl. Apply it to your dry hair. Leave it on for five minutes and then rinse it off with cold water. Use this conditioning mask twice a week, and you’ll start to see a difference. 1. To remove age spots and wrinkles – Apply plain curd on your face daily and leave it on for 15 minutes. Curd is rich in lactic acid, a natural alpha hydroxy acid, that helps to improve your complexion and makes it softer and more radiant. This application wards off premature wrinkles and age spots too. You can add honey, lemon or cucumber to curd to enhance the efficacy of curd. 2. To get fairer complexion – Apply curd/yogurt mixed with honey on your face daily. On continuous use, your complexion will get fairer like never before. 3. Remove blackness of neck – Apply sour curd on the blackish part of your neck and leave it on for 15 minutes. Then wash off with sour curd. This application will help in eradicating the blackness of your neck. 4. Acne treatment – If your acne is annoying you too much, then you can rely on sour curd to fight this problem. Just dab sour curd on the affected area and wash off after 15 minutes. Your acne will start diminishing after regular use. 5. Hair Conditioner – Curd is an excellent conditioner for your hair. Just apply curd on your hair for 30 minutes. Afterwards, wash off with cold water and experience softer and glossy hairwithin minutes. Curd can be added to henna and eggs hair maskto bring shine and volume to your hair. 6. For healthier and silkier hair – Mix curd/yogurt with black pepper powder to apply on your dandruff –affected hair twice a week. This hair mask is very beneficial in giving you thick, healthy and silky hair that enhances your beauty quotient. 7. For fairer, glowy skin – Gram flour mixed with curd /yogurt is the best face mask one can apply daily. Smear this face mask on your face, neck, hands and legs for 15 minutes before taking shower. Regular application of this face mask makes your skin fairer, softer and glowing. 8. Skin lightening – Orange peel powder mixed with curd gives an excellent result in lightening the skin tone. Use this mask daily to see the gratifying results. 9. For softer and fairer skin – Add rose water and turmeric to curd. Massage your face with this mix for 15 minutes and wash off with warm water. You will get softer and fairer skin right after the application. 10. Exfoliation of skin – Add egg, parsley or oat to curd to remove the dead skin cells of the skin. This face mask is the best for clearing and exfoliating your skin. 11. For healthy nails – Add lemon juice to curd/yogurt and apply this solution on your face. This application will grant fairer and softer skin in an instant. You can massage this solution on your hands and nails also to get shiny and healthy cuticles. 12. For blisters and sunburn – Apply curd on your sun burnt skin to heal and soothe it quickly. The fat content in curd helps to cure blisters and peeling caused by suntan, over a short period of time. So now, that we are aware of the best 12 beauty benefits of curdand know how to use yogurt in our beauty applications. So let’s do not wait anymore! Let’s try out these amazing beauty uses of curd in our skin care regimen right now! Get set to flaunt your radiant skin to the world with confidence!